To explain why this represents a problem, it’s worth giving some background. Any radio amateur will tell you that amateur radio is a wonderful and diverse pastime, in fact a multitude of pastimes rolled into one. Working DX? Got you covered. Contesting? UR 599 OM QRZ? Digital modes pushing the envelope of atmospheric propagation? Satellites? SDRs? GHz radio engineering? All these and many more can be yours for a modest fee and an examination pass. There was a time when radio was electronics, to all intents and purposes, and radio amateurs were at the vanguard of technology. And though electronics has moved on from those days of purely analogue communications and now stretches far beyond anything you’d need a licence and a callsign to investigate for yourself, there are still plenty of places in which an amateur can place themselves at the cutting edge. Software defined radio, for instance, or digital data transmission modes. With an inexpensive single board computer and a few components it is now possible to create a software-defined digital radio station with an extremely low power output, that can be copied on the other side of the world. That’s progress, it’s not so long ago that you would have required a lot of dollars and a lot of watts to do that. Against that background, a casual reader could be forgiven for missing all this progress and coming away with the impression that amateur radio construction is a world of discrete components with part numbers you would have found in a supplier catalogue from 1975. It is unfair to pick on Sprat alone though (after all, its editor [George Dobbs G3RJV] is a personal engineering hero), this seems to be pervasive across a spectrum of publications in the field. So why, given that there is a lot of interesting new technology for radio amateurs, do we see so much of what essentially we have seen many times before? The answer of course is that there is a demand for it, and it’s easy to see why that is the case as there is undoubtedly an elegance to making a working transceiver for next-to-nothing from the minimum of parts. There is however a deeper reason for that demand, and it lies in what different radio amateurs are comfortable with. If you know how to make discrete transistor circuits but for example surface-mount soldering scares you and the intricacies of GNU Radio are beyond you, then of course you are going to prefer the safe and friendly world of 1975 when it comes to parts selection. You might ask why this is a problem, after all if a demand exists and is being sated, isn’t that a good thing? But there are so many more recent technologies to be explored in amateur radio, and maybe the various media outlets that serve amateur radio aren’t fully tapping that demand as well. In this I include Hackaday, because while we are not a radio amateur publication as such it is definitely true that radio amateurs are part of our constituency. A significant proportion of Hackaday writers have callsigns, and we like to cover amateur radio stories. We’ve taken you through some of the fundamentals of software defined radio and tried to cover GNU Radio in detail, but are there any other fields we’re not giving enough attention to? It’s something we’d like to ensure we get right, if there’s a field of amateur radio you’d like us to cover, let us know. As always, the comments are open. This is a great analogy. I like making the occasional regenerative receiver, with FETs or tubes. In contrast to today’s digital electronics, a regenerative receiver contains very few active components, but the quality of the reactive tuning components (inductors and variable capacitors) has great effect on the receiver performance, as does the layout. It’s almost electronic haiku – very few parts but each must be selected and connected with care. Yours is an outstanding analogy. Half an inch, in or out, on a jib sheet makes the difference in crossing the finish line first. The local Ham club gave a free course starting the end of October, taking my Technician class test tonight! Congrats! I still need to get mine. Do it! For the electronics tinkerer a license gets you access to play with frequencies you are 100% legally allowed to use and access to other people who might be listening and can respond. Bravo!! This is a wonderful hobby you can involve yourself as much or as little as you want. Enjoy the radio, Thank you for passing your test. In the old days, the ham magazines reflected “state of the art”. Not just in the early days, but when SSB came along, and there was a synchronous detector (using a PLL) in CQ about 1958. As moonbounce took off, there was lots about under the noise detection. There were transistor based keyboards for sending CW, and projects for decoding CW to a printer before computers . When packet radio came along, it was there too. It didn’t mean everyone was doing it, but it meant it was accessible, and it might rub off on any of the readers. Then it shifted. Ham Radio magazine closed down. CQ slowly did less and less technical stuff, though there was period when it seemed full of schematics for the wiring between a packet controller and a transceiver. QST decided the “technical” stuff should be in a dedicated magazine. Even the reviews, which had long included bits of schematic of the equipment which might interest readers, that disappeared. 73 peaked and then went into a long decline, before finally closing down. So the stare of the art is in QEX, which has a fairly high subscription price (and higher if you aren’t an ARRL member), or in what mounts to newsletters. The wider ham population doesn’t want “that technical junk” so is no longer subsidizing the delivery. It means the technical stuff is more concentrated, but you have to pay for it. Though, you don’t get the contest results. For the rest, it means the magazines aren’t cluttered with that technical stuff. It makes ham radio appear less technical. Which changes newcomer’s perception. It’s positive feedback, each iteration making it easier for the non-technical type, making the hobby more appealing to others (and the license requirements have shifted too, but I’m not sure which is cause and effect). I think it’s made it easier for older people to get into the hobby, which in turn shifts things further. At some point, the oldtimers will be gone, those who came in at an early age because it was a technical hobby, and then there’ll be no restraints. It’s newer people that seek office at the local ham clubs, and they are increasingly the ones who came later to the hobby. I was licensed at age twelve, in 1972, and many of the hams from then have died. 45 years later, I’m getting on, except I started so early. I very much wish I could substitute QEX for QST with my ARRL membership. I wish QEX was online and not print only. That would be great for me. I don’t think you’re correct. Look at the QCX transceiver kit which was featured on HaD back in September. That’s definitely not something that could be from the 1970’s. As for all the designs which could be, there’s nothing wrong with using 2N2222s and such to build a pure analog radio. The problem with designing a “modern” radio is complexity. If you build an analog system, then it’s not going to be appreciably different. After all, it’s very hard to come up with new oscillators, amplifiers, mixers, etc. You preyty much have to find new part numbers because so much stuff is no longer made. I’ve seen long threads on finding some off ball part someone used in a published circuit. Those old designs are like the original VW. You don’t need a lot of information to fix it. There *is* virtue in that. However, the performance is not equal to a modern design. Cheap computers have fundamentally changed things. One thing many forget was the fact few “Elmer’s” was willing to assist new hams in 70-80s. The hobby declined drasticly because of this “I’m not going to help any new ones because the ham bands belong to US alone” attitude of most hams then. And that is from experience of myself and many others. I got licenced in 81 and since was “only” a general was totally shunned by any advanced or extra class on air. I and others got so disgusted with the “good ol boys club” that I and others just quit and let licence lapse. Re started in early 90s and AGAIN the “not on OUR freqs” attitude pops up and refusal to speak to any new ham techs or allow any on repeaters unless general or higher class. So 70s and 80s was good.. as long as you jumped thru their hoops. Maybe that was true where you were but not so everywhere. I got my ticket in 1966 1st a novice at age 11 WN4IVG. I had lots of help we had a class three nights a weej. 20 people in the class 15 or more gto their license. We had several teachers all hams I a lawyer, a high seas marine radio operator, and a school teacher and a piolt. Then I went on to get my technicians license WB4IVG. The 70s were great 2 meters and 450 boomed. I helped many people get their license. My dad WB4STQ and I brought many into the HOBBY. I finally got my General and have until recently continued to teach and help others not only get licensed but help them build their stations. My dad went on to get his Extra I may do that some day when I have the time. Yes there are Lids and AHs they abound but that is why we have so many frequencies, SPIN THE DIAL! These dummies can only talk to them selves for so long then they just go away! BTW I am a life time career RF Engineer all because of Ham Radios and not being thin skinned! This is so lazy, c’mon give us links! More hacks, less op-ed and where there is op-ed, at least provide references. Don’t think it was right teaching a 10 yr old ohm’s law and resonant circuits but there was nothing else to do but hang out with Uncle and Dad, both had shacks, Uncle’s size of a small house. Might have been more motivated if I was allowed to touch the teletype instead of just drool 10 feet away from it. The MARS and EME work was interesting, LORAN had my attention as something useful but all the rest honestly just always the same thing, someone on the other end that couldn’t talk anything but electrons and brag of arrays. It was the days of “spit in the back and whomp it one” to get the tv working again. 6th grade being taught COBOL on punch cards when wanted to just be left to welding up a minibike frame. 8th grade first motorcycle, later a Harley for high school. USAF saved me… the SPC 16/60, magnetic core… my own teletype, now there’s a hobby! Then 7400 series, Cosmac processor and all excited hand keyed in first code to blink a LED, showed it off to the wife. “You spent HOW MUCH to blink a light!!! ?”; as she threatened with the broom again. 2704 EEPROM imagine that, no more dip switches! Remember Bit-Boffer? Made a mint off acoustic couplers with a modem board I made… but it was the broom again when wife opened a long distance $300 phone bill. Radio had it’s day… it was short. You can still get on the airwaves and listen, I’ve always kept a shortwave. Still the same, just guys talkin. More fun to listen to the whistles and pops from Jupiter. My experience of ham radio is that most hams just want to operate a ready made brand new rig, aerial and atu, something of which I have literally zero interest in. 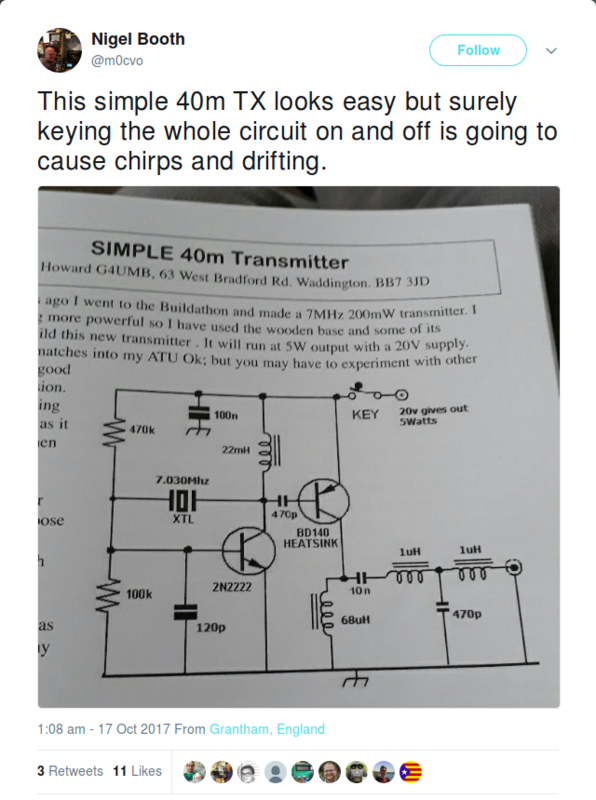 To give an example of this, I remember upsetting a Yaesu 1000MP owner after signal reports favored the quality of the my KW2000 with a home made long wire aerial. Seems to be more of a spending competition than a technical hobby these days. I would love to see more simple homebrew transceivers (not CW) on HAD to try and get people building. I can grant this wish. Seriously! Who is the new HaD graphic designer?! That is another COOL illustration! BTW Can I steel it for my quantity one time t-shirt? The same Joe Kim as always. And yes, we always look forward to see what he comes up with. Can’t comment on use of images on t-shirts, save to say it’s a copyrighted image. Apologies. Yes. Making functioning radio equipment using a bare minimum of parts is something some hams do just for the challenge of it. It goes farther than just 2-transistor transmitters. I have even seen single transistor transceivers! While it’s true that it is unlikely that someone building such things will ever push the state of the art in doing so it can be rewarding as a challenge just like many of the less-than-practical hacks we all know and love right here on HaD. Yes, there are also people who build such things because these ‘old’ parts are what they know and love. Some people, especially old-timers just don’t want to adapt to the newer stuff. That’s ok, whatever floats one’s boat right? The cool thing is CW is still CW, SSB is still SSB, etc… they are working with the same radio waves. When grandpa fires up his old hearing-aid transistor transmitter a person using a state of the art GNU radio setup or the latest and greatest billion transistor monster from Yaseu or Icom can just as easily come back to him as another old-timer! There’s a place for us all. I think you missed the best thing about these simple designs. This is the reason that it isn’t just “unfair to pick on Sprat alone” but rather it’s unfair to pick on Sprat (and the like) at all. You can learn from it! These basic circuits are fundamental building blocks. Those chips you surface mount solder onto your professionally etched-PCB that you sent your CAD files to some shop to etch for you… they aren’t just the inert pieces of black plastic they appear to be. They are full of circuits that are combinations of many basic building blocks combined together to make something greater. If you want to understand what is going on inside there beyond just learning a pinout and calling it ‘magic’ then studying these simple circuits “like it’s 1975” is the way to go. Personally I intend to build much of this kind of stuff soon, right after I finish the current round of more ‘up to date’ projects. I neither want to do it “for the beauty” or because I am afraid of newer parts. I want to do it because I don’t believe in magic and would rather learn what is going on inside those chips. It’s not a destination for me, I see lots of surface mount computerized stuff in my future too. It’s just an important part of the journey. The only down side is that most of these things are for CW and I don’t really enjoy morse code much. Some people love it but I’m more of a visually minded person and listening to the timings of dits and dahs just isn’t really for me. The thing is though that CW signals are simple to create, SSB is hard and AM/FM are too inefficient to really get any distance with low power, which also usually goes with simple designs. If you are counting the transistors in your circuit CW is just the natural choice. CW + Microcontroller ~= Teletype. Go 1975 on the front-end, but 2005 on the back-end. Great idea but it kind of suffers from a chicken and egg problem. I’ve tried something similar, using a PC w/ soundcard interface to send/receive CW. Send works great but receiving has too many errors. The best signals are at least readable because you can guess the messed up characters by context but most are not. Even the good ones aren’t good enough because there is no real context to guess a person’s corrupted callsign characters. Anyway, I say chicken/egg problem because my understanding (from reading various internet forum posts) is that the problem stems from the computer (or microcontroler) software not dealing well with the natural flaws that are found in hand-sent morse. Humans just aren’t precise enough of senders. So.. if lots of other people started doing this it would be ok because we could type to each other. But… that probably won’t happen because the early adopters have nobody to communicate with and give up. I once fantasized about writing a blog article in which readers imagine them stranded on a desert island after a plane crash and have to reuse pieces of smashed technology available to build something to send a SOS. The point is: you can build a generator using scrounged motors or magnets and wire, then make a CW transmitter with parts taken from any switching power supply. Actually one could make an emergency transmitter out of old PCs found in a dump. That kind of “old” technology is something that maybe doesn’t fit in a pocket or have the longest battery life compared to newer stuff, but can be made and modified from regular human hands, ie it’s the latest example of stuff made for humans by humans, that’s why dismissing it with the term “old” wouldn’t do justice to it. I’m very interested in this topic, please keep it going! Building Amateur Radios using minimalist components and least power consumption is endemic – and there’s a good reason for this: A key (if not primary) objective for the radio amateur is to provide communications when no other means exist – disasters for example. As of today, discrete (mostly) pure analog builds meet this objective. But this is changing. Watch what happens (hopefully) in the near future when (and if) stable cookie-cutter builds using DSP capable micro-controllers (STM32FX come to mind) merge with stable direct-conversion and/or low-IF DSP fully open software libraries anyone can easily use. We’re not there yet – but close. I build many of the projects in Sprat and from Experimental Methods in Radio Frequency Design not necessarily because they are the best stand alone radios but for what the ‘building blocks’ can teach me. Practical analog design experience is a good skill for a well rounded radio amateur. On the flip side practical digital design experience is a good skill for a well rounded amateur radio operator. While many aspects of analog will be in play for some time, modern digital RF modulation and data transmission techniques have been the state of the art for 50 years now. With new component performance, sedate old circuits can have new lives. An example was the optically coupled regenerative receiver. Because the regeneration was coupled in a way that did not interact with the tuning, it was a surprisingly stable and effective little receiver. Is it a 1970’s (or 1950’s) thing? I guess it is. But the goal of this hobby has always been to explore what can be done with how little. There are many “brute force” efforts toward high performance radio design that people can use. But some of the fun in radio is taking a second look at a “discarded” design to see what is still possible with them. And then there are the silly things that some people try: The Voice Powered CW transmitter. Why? Because you can! It’s sort of like designing a bar-stool racing machine with a V8 engine underneath it. It’s ridiculous, but I’m sure there someone out there who wants to build it and try it for fun. It’s not all about performance. It’s about being a hobby and trying odd things that nobody has tried before.